Hot Coral – Echinacea by any other name won’t be as Expensive! One of my Volunteer Jobs being a regional representative for the Garden Conservancy ‘Open Days’ Tour is not only to find great gardeners to participate, but also promote the tour. One way is making sure posters are delivered & postcards put out and about. Garden Centers are very kind to help promote the event, so off I went in a 50-mile radius. 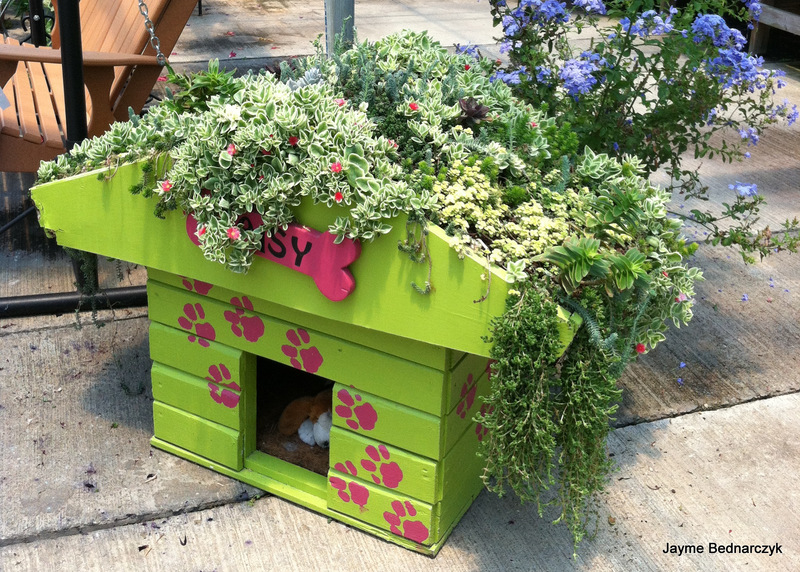 Not only did I find this charming roof top succulent garden for a lucky pooch, I gathered up some reduced herbs for a herb planter to take as a hostess gift. I headed out of the greenhouse to an outdoor covered area, and there it was… Heart be still… just in – was it love at first sight? I circled the tall-shelved wheeled cart, and tried to walk away, but the colors tugged at my heartstrings again… I was hypnotized – lost in the array of hot fluorescent colors – an array of pinks, & corals. 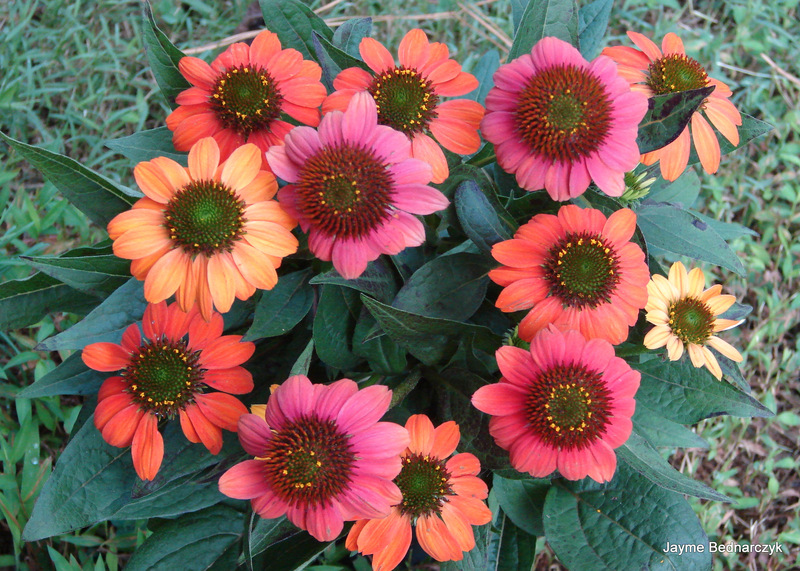 Echinacea Sombrero ‘Hot Coral’ – Echinacea by any other name won’t be as expensive! I had tried to be good all summer, limiting spending of any kind in these economic times, but this one I could not walk away from. I could feel the butterfly within circling around and around – flying off but then drawn back in… Oranges are HOT… It didn’t matter the price tag for this perennial – of a whopping $21.00. My obsessive brain took over… It will keep these kind folks in business… I couldn’t purchase a cut flower bouquet for this amount… Well, I’m here and they will certainly be gone, and then there’s the gas if I drive back… Oh the ecstasy of the color – I am color centric but that’s something to muse on another day – home it came with me. As my luck would have it, Fairview also had Roses on sale. Again my eye spied orange and I was drawn in. The great gals I volunteer with, at the JC Raulston Arboretum Mixed Border affectionately known as the ‘Border Babes’, are a diverse, opinionated, yet congenial group. We are all gardeners, our styles are as distinct, as we are, but this is a plant we all agree on Rosa ‘Paprika’ – delicate in size, but intense orange buds, that evolve to a soft coral when open with a sunny center – a real show stopper. Disease & spot resistant. When we first planted it in the Mixed Border several years ago, the official plant marker said ‘OSO EASY Paprika (R. ChewMayTime ppaf)’. We were delighted when this plant hit the market! Talk about Smokin’! We all like to cook and many of us are fond of Smokey Spanish Paprika – so this Rose like its spicy culinary counterpart is sure to Spice up your garden life. R. ‘Paprika’ will be perfect further back in the bed and will color echo the ‘Hot Coral’. The eye will samba from E. ‘Hot Coral’ over to R. Papricka. Supporting players will be Barberry ‘Crimson Pygmy’ – a dwarf Japanese Barberry. I can visualize it from my deck butterflies swirling around. No guilt, no shame, we’ll have Mac n cheese tonight – I’ll add some cherry tomatoes, a little cilantro and finish with Smokey Paprika! Next it was off to Campbell Road Nursery – a no frills nursery, but always cool, cutting edge plants! 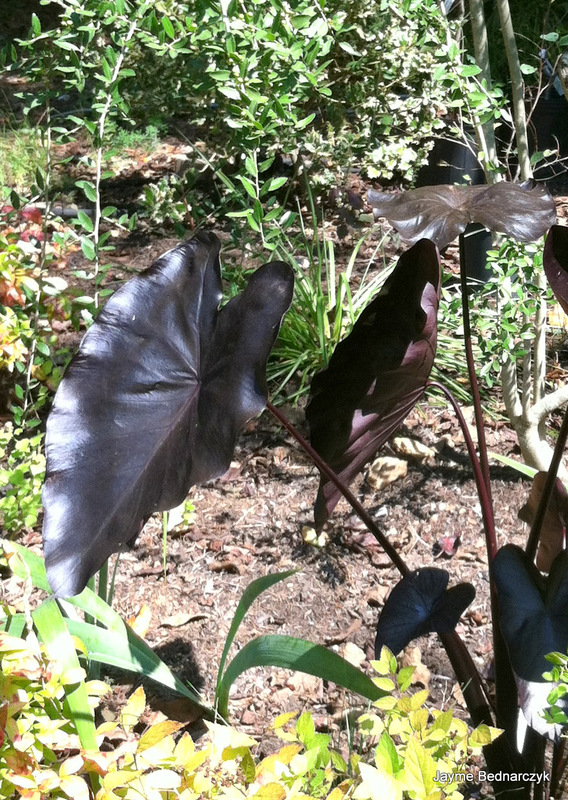 I spied a Colocasia ‘Black Coral’ – hardy black taro… I hadn’t had lunch and it looked the color of a dark chocolate bar – It would be great behind & to the left of the ‘Hot Coral’ … the bed anchored by a pink & yellow nesting box with ‘Hot Coral’ & ‘Black Coral. ‘ An analogous color scheme of oranges & pinks… Ahh…. I asked Plantsman Layne Snelling about ‘Black Coral’ and he mentioned it was part of the breeding program by John Cho (not to be confused with the actor of the same name) at the University of Hawaii Plant Breeding Program. One of the benefits of Cho’s breeding work is short or no stolons – which means no chance of invasive runaways… plus hardy to zone 7B… this went into the floor of my back seat! I can’t wait to get home to plant this fiesta! I love seeing folks with plants in their vehicles… always brings a smile to my face! Sometimes I have thoughts of following them home to see their gardens, but alas as I merge into I-440 at rush hour, I am satisfied to see the chocolate elephant ears swaying in the rear view mirror headed home to an Entwined Life!